Shadwell Opera has had a good year. Their production of Philip Glass's In the Penal Colony in June 2014 was immensely successful, receiving good reviews and national coverage, and their two short films for Channel Four's Random Acts were watched by nearly half a million people. The group is now fund-raising for its next projects and has a concert at Shoreditch Town Hall on 18 November 2014. 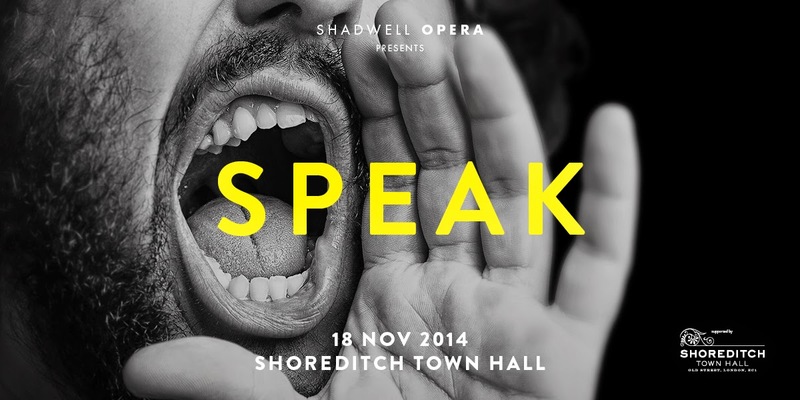 SPEAK explores the boundaries between speech and music, and features three 20th century masterpieces, Ravel's Trois Poems de Stephane Mallarme, Walton's Facade and Schoenberg's Pierrot Lunaire. The performers are sopranos Sarah-Jane Lewis and Alice Rose Privett, with Jennie Stafford and Love Ssega as the narrators. For those that don't know Love Ssega is a British singer, rapper and record producer who features on Clean Bandit's Mozart's House. In a recent article Rupert Christiansen talked about how the spoken text of Facade is akin to rap, so it will be interesting to see what comes out of the performance. Finnegan Downie Dear conducts. Shadwell Opera is the brainchild of Jack Furness who founded the group in 2009 with three other Cambridge undergraduates. In addition to the Glass, past shows have included Mozart's Cosi fan tutte and The Magic Flute, Britten's A Midsummer Night's Dream and Albert Herring and Jonathan Dove's Siren Song. Further information from the Shoreditch Town Hall website, tickets from TicketSource.